As soon as the weather turns warm, I have 2 thoughts: “VEGETABLES!” and “BATHING SUITS!” The first is screamed in excitement; the second in horror. The slow braises and hearty pastas of winter have taken their toll on my thighs, and now that their season has passed, it’s time to get serious. And fast. Fortunately, my vegetable excitement happens to be a perfect solution to my problem. There are enough fresh vegetables to keep my diet interesting and varied, and unlike their wintertime cousins, they’re delicious pretty much all on their own. 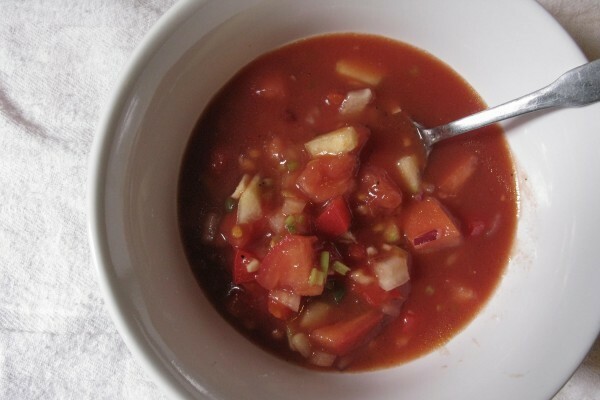 Which brings me to: gazpacho. I’ll use this opportunity to confess that I really don’t like soups. Sure, a good matzoh ball soup has its moment, and when I’m sick I’ve been known to break out a can of Campbell’s, but in general, soup bores me. It’s always too hot, it doesn’t ever have much variety of texture, and there isn’t enough chewing involved. I really need to chew food to believe I’m eating it. Psychoanalyze me later. Full of fresh (and cheap!) produce, and easy to make, this is more than a soup: it’s a full-on meal. 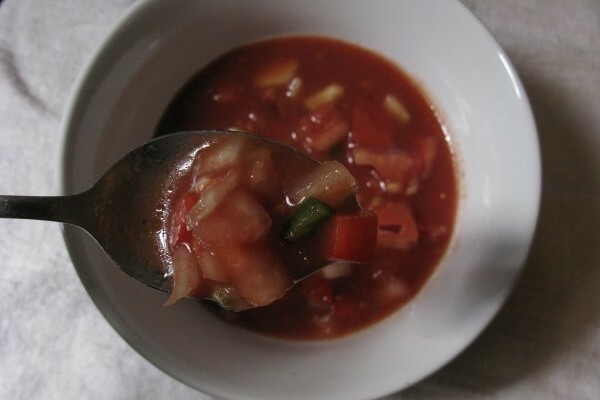 In case you haven’t guessed, I like my gazpacho chunky. It’s easier to make, you don’t have to clean up any special tools, and yes, there’s more to chew. This recipe is so easy I’m almost embarrassed to post it, but it has sustained me during many summer months (it’s ideal for healthy worktime lunches and easy dinners), and there’s a lot less oil in it than most recipes I’ve found. With any luck, I’ll be in that bikini in no time. Any of these ingredients can be swapped out for vegetables more in season or which you prefer. This is an endlessly versatile soup. This recipe makes a fairly spicy version; so if you’d prefer, cut back on the cayenne and chili paste. In a (very) large bowl, mix all ingredients together. It will probably be pretty thick and very chunky, so if you want more liquid, thin with about 1 cup of cold water or more tomato juice. If you like your soup pureed, do so in a blender, food processor, or with an immersion blender. Refrigerate until ready to serve. Hey There. I discovered your weblog the usage of msn. That is an extremely well written article. I’ll be sure to bookmark it and come back to learn extra of your helpful information. Thanks for the post. I will certainly return.